Grand Strand Resort II in North Myrtle Beach, South Carolina is the perfect place to rest while you spend your vacation in sunny North Myrtle Beach, South Carolina. Spend every day of your vacation oceanfront in any one of these one-bedroom Grand Strand Resort II condos or travel a short distance from your North Myrtle Beach condo to any of the amazing restaurants or places of entertainment to enjoy during your stay in North Myrtle Beach. While staying in North Myrtle Beach, SC at the Grand Strand Resort II you will be staying oceanfront in a traditional one-bedroom condo. Grand Strand Resort II is on 16th Avenue South only a few blocks from Highway 17. Highway 17 will give you easy access to all of your North Myrtle Beach adventures. Grand Strand Resort II in North Myrtle Beach is located in the Crescent Beach area of North Myrtle Beach. Crescent Beach is an enjoyable family beach with endless ocean fun. 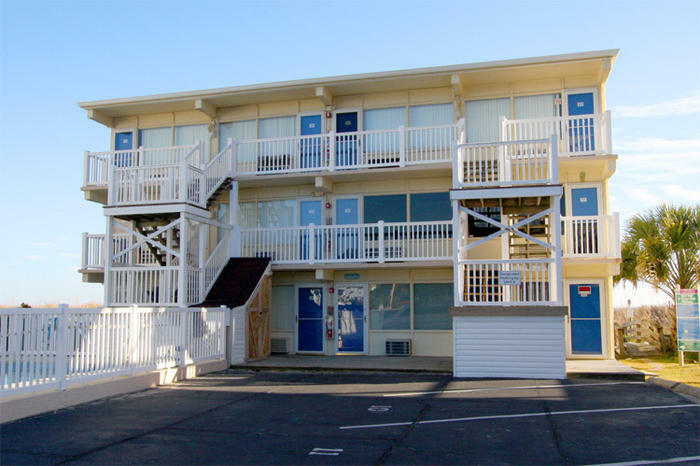 Access to your one-bedroom condo in Grand Strand Resort II is easy. Find a parking spot close to the entrance of this quaint North Myrtle Beach resort, walk right in to your first floor one-bedroom condo or take the stairs up one or two flights to the second or third floor where you will find a very comfortable, oceanfront, one-bedroom condo to enjoy during your stay on this North Myrtle Beach vacation. While staying at Grand Strand Resort II in North Myrtle Beach, South Carolina you will have easy access to days with your feet in the sand and enjoying the ocean breeze. Grand Strand Resort II offers you and your a family an easy sandy path just outside the entrance of your North Myrtle Beach resort that will take you a white sandy beach and the great Atlantic Ocean. It will only be a minute before the ocean waves are washing over your sandy feet and the North Myrtle Beach sun is warming your skin and giving you a perfect tan. When following the path back from the sun and sand of North Myrtle Beach, South Carolina, stop at the Grand Strand Resort II ocean side swimming pool to cool down. Take dip in the crystal clear waters of the swimming pool or lounge in a chair poolside and listen to the ocean waves crash against the sandy shores. Grand Strand Resort II condo rentals in North Myrtle Beach, South Carolina offer affordable one-bedroom condos that have outstanding views of the North Myrtle Beach ocean. Each one-bedroom condo comes with its own private balcony. Sit on the couch in the living room and look out the floor-to-ceiling windows out to the ocean or step through the sliding glass door into the ocean breeze for your very own view of the Atlantic Ocean and the North Myrtle Beach sand. Every morning you can grab a cup of coffee, step out onto the balcony and enjoy the sunrise over crashing waves. Or every afternoon make a lunch and eat it on the balcony with the sound of laughter and ocean waves helping you lose track of time on your North Myrtle Beach vacation. Elliott Beach Rentals is not affiliated with onsite management or the HOA of Grand Strand Resort Ii.